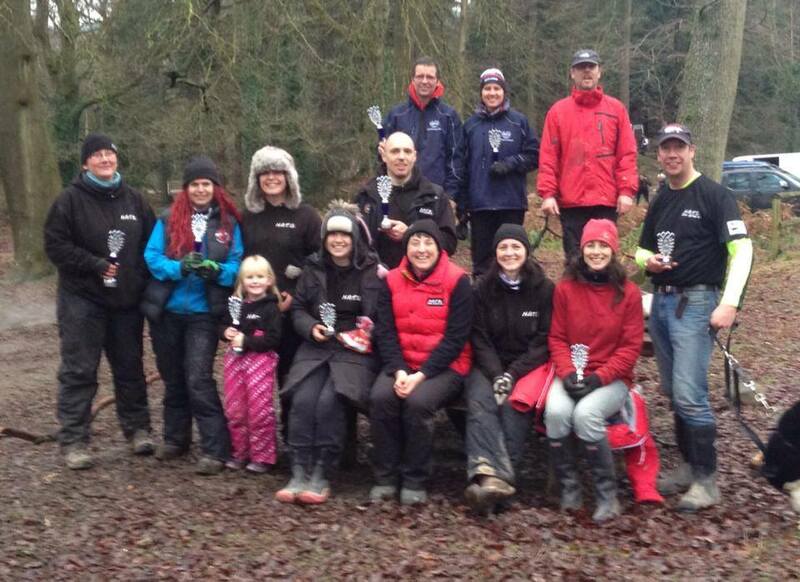 The Iain Hutchinson Memorial event, hosted by Wyedean Mushing, under the ABSA banner was held over the weekend of the 11th & 12th January and was just down the road from K9 Trail Time in the Forest of Dean. The races were run over the same course as we ran back in October, so we started off uphill from the Beechenhurst picnic area and then left down a long, wide hard packed track and out around the rest of the trail in the woods. The difference for us this time was that we knew we’d be starting out in the dark, as the Saturday race was an evening race. 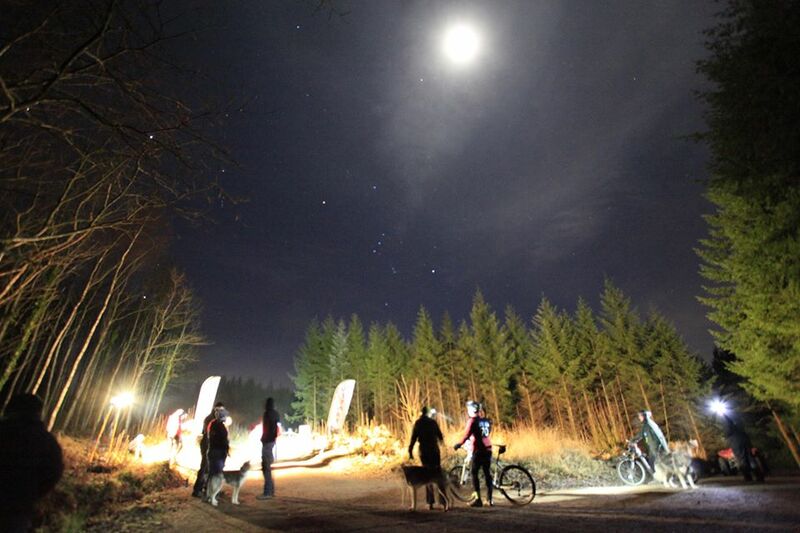 With lights galore on the bike, Donnie and I managed a respectable 5th place after our efforts around the night trail. Riding in the dark is in some ways easier because you concentrate more on staying on and seeing where you’re going than choosing a line, plus there’s no public on the trails. However it is also quite frightening at times, especially when you can’t see the slippery mud until you hit it. Knowing we had some time to make up, we tried our best on Sunday morning to negotiate the trail with a little more style than the night before. Unfortunately a few stops to say ‘hello’ to members of the public who were dog walking and a couple of dips in puddles we couldn’t see in the dark, meant we were actually a few seconds slower than the night run. Somehow we managed to creep up to third and take a podium place, coming second only to fellow NATB Dogs Sports members Mark Mazzucca (current European Bikejor Champion) and Mike Stone. It really does prove that you should always try your hardest, as it is very often down to luck and the mood of both you and your dog on the day. I’m always pleased with my results in the bikejor as Donnie gives 100% effort 99% of the time. The Wyedean Mushing events (http://www.wyedean-mushing.com) are always well organised, fun and friendly, and the Iain Hutchinson Memorial race was no exception to this. Once again this was the first time there had been open classes to allow us to race with non-registered and non sled dog breeds of dog, so we are very glad to have been part of this great weekend of racing. The ABSA Wareham Forest event hosted by South West Coast Sled Dogs was the first ABSA event we had actually managed to compete in, although we had entered previous events and had to withdraw due to injury. ABSA events tend to be primarily ‘wheeled’ events and this one held on the 4th & 5th January 2014 was no exception. 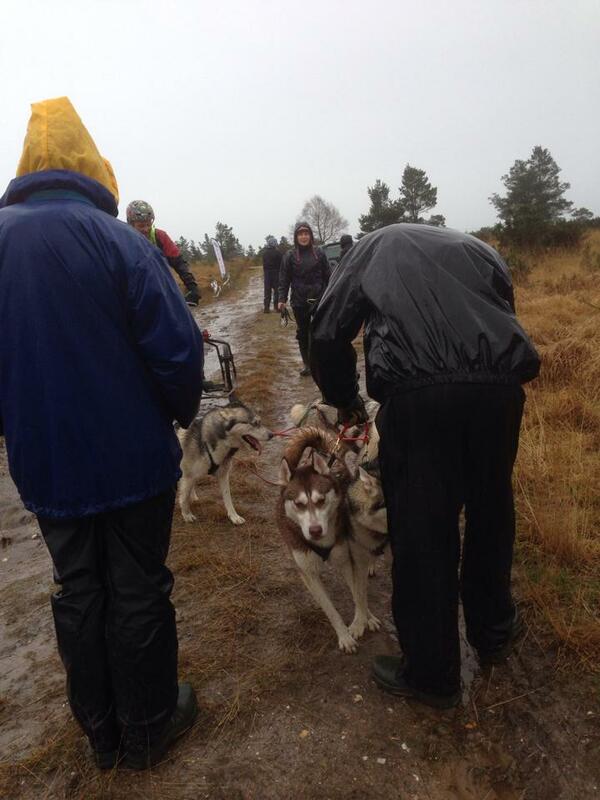 Held in the forest near Wareham, the event weekend was forecast to be a very wet one and it was certainly that! We arrived in the rain on Friday night and camped at a local tourist park (there are many to choose from) called Birchwood. The rain stayed with us throughout Saturday morning and when we got to the venue of the racing, much of the forest was already beginning to flood. 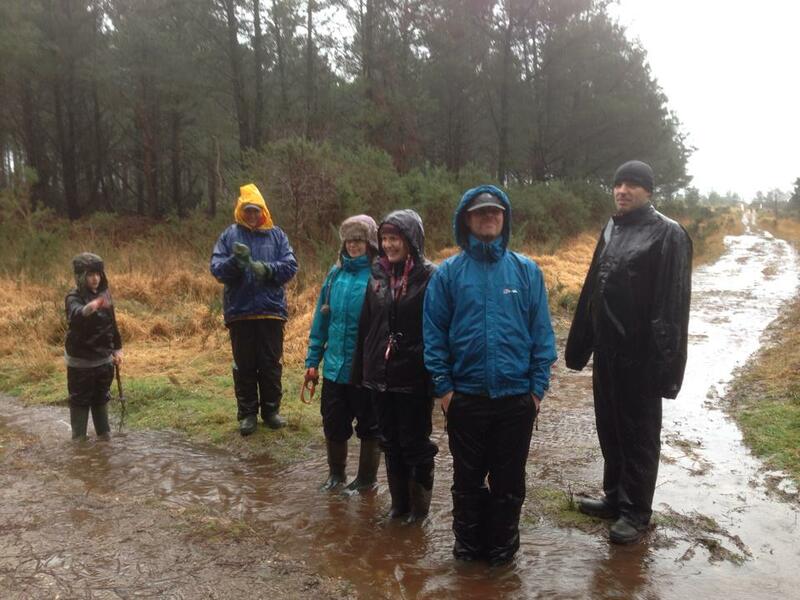 The Forest was beginning to flood Saturday morning in the torrential rain! In spite of the rain, everyone was in good spirits and we completed the morning racing safely. For the teams of dogs on the rigs the course was longer at approximately 3 miles but for us on the bike it was a short course of just under 2 miles. By the time we started, even the start chute was beginning to flood but after setting off, the rest of the course wasn’t too bad and most of it was slightly uphill to begin with. The course gradually worked it’s way around to the right with gentle inclines on wide trails that were flooded and slippery but not too much of a problem on the bike. There were marshals in vehicles dotted around the course, even for the short course we were riding, so we were being kept safe at all times. After about a mile the course took us back down to the right via a sharp turn and then a long downhill which was very slippery then a left, back uphill before a right into the finish. The wet weather didn’t let up for the majority of Saturday! The course was the same for both days and after Saturday we were lying in third place in the bikejor class, praying for the rain to stop so that Sundays’ races could go ahead. On our way out of the venue the roads were all flooded and it wasn’t looking good for the next day but thankfully we did get a spell of dry which allowed the flood waters to recede. Day two was not quite as successful for us in spite of the better conditions and we lost out on a podium place by less than a second in the timings. 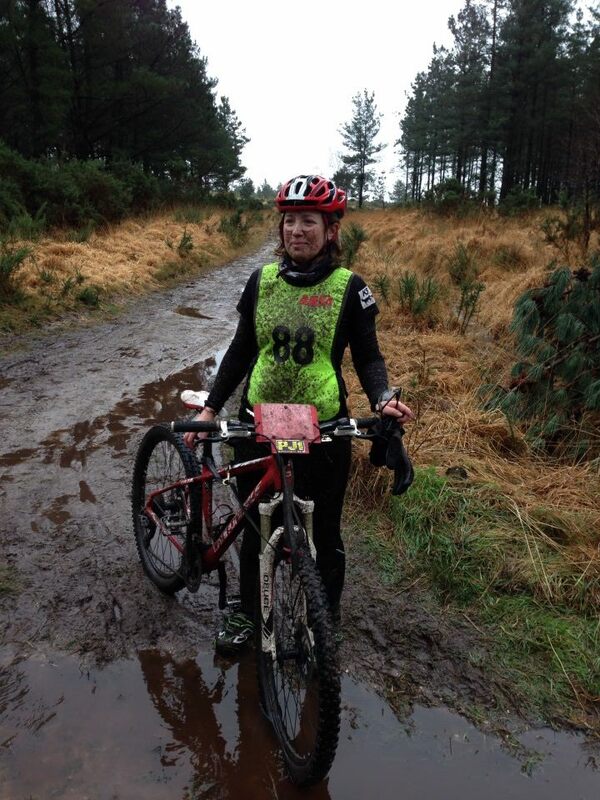 I found the course slightly easier to ride but so did everybody else and it was a competitive class! We finished up 4th and I couldn’t have asked for any more from my little Sprollie, the 3 dogs who beat him were all much bigger than him which can make a difference purely on the stride length they can take to cover the ground. We enjoyed our trip to Wareham as much as we could given the weather and are thankful to ABSA for opening up their races this season and allowing us to compete in the open classes. The fact that these traditional sled dog organisations are recognising the demand for classes to accommodate the non-sled dog breeds of dog, is a huge step forward in the progress of the sports in the UK. ABSA is unfortunately not going to continue as an organisation after this season but I sincerely hope someone steps up to take the reins so that we can continue to attend these fantastic events, run by real dog sport enthusiasts. 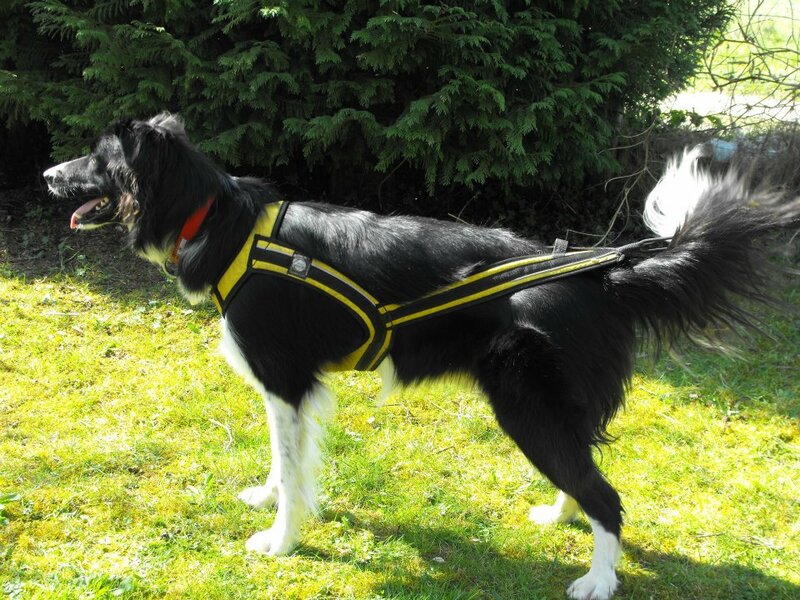 The Zero DC Euro Long harness is one of the most popular modern options for canicross, bikejor and scooter racing and training because of the unique design which leaves your dogs’ back free to arch when pulling. In this short blog I will point out the things to look for in fit to make sure you get your dog in the correct sized harness. The Zero DC Euro Long Harness can be used for all disciplines as long as you get the fit right! 1. The Neck: The most important part to get fitted correctly on the harness, the neck should be snug around the dog’s lower neck area and not be high enough to pull into the throat. Ideally you should be able to get about 3 fingers in the neck when the harness is pulled tight. The material of the cone shaped neck should also not restrict the shoulders in any way, if the material covers the point of the shoulder at the front then it may prevent the dog from striding out in the harness. 2. The Ribs: The middle section of the harness should be roomy when the dog is standing around and may even look ‘baggy’ when the dog isn’t pulling into it. The harness should clear the front legs easily and sit behind with enough clearance to allow the dog to fully stretch their legs backwards. The harness should fit snug against the side of the dog when it is pulled tight and the dog is leaning down into it, although you should still be able to fit your hands down either side to allow for the lungs to expand when the dog is working and breathing hard. 3. The Length: The last section of the harness where the line attaches to should come to more or less the base of the tail but this can vary dependent on the dog and a slightly longer or shorter length will not harm your dog due to the way the harness is designed to work. In the picture above the length is more or less perfect with the cord to clip your line to extending beyond the back of your dog. Fitting notes: The Zero DC Euro Long harness will most probably be snug to get on and off your dog, both over the head and to get the legs into, so don’t automatically assume it is too small because you have to maneuver your dog into it! To fit the harness on your dog, firstly gather up the back of the harness and slide it and the neck piece over the head of your dog. Next pull one of your dogs’ legs through the harness, you may have to bend your dogs’ leg up and forward to do this, then repeat with the other leg and pull the back of the harness into place at the base of the dogs’ tail. Once you’ve got your dog in the correctly fitting Zero DC Euro Long harness you can expect your dog to pull freely and enjoy your sports. 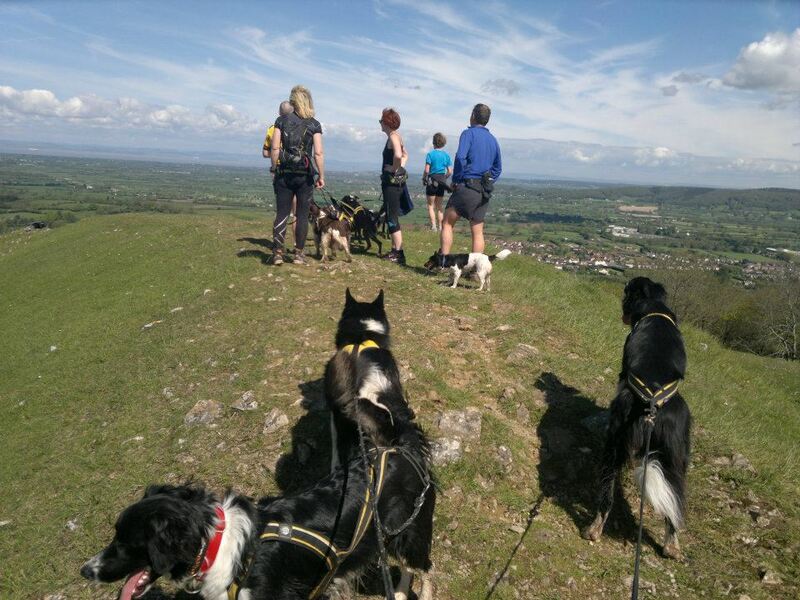 With all the different events we’ve been attending recently, one of the questions I get asked most often is how to get started with canicross. 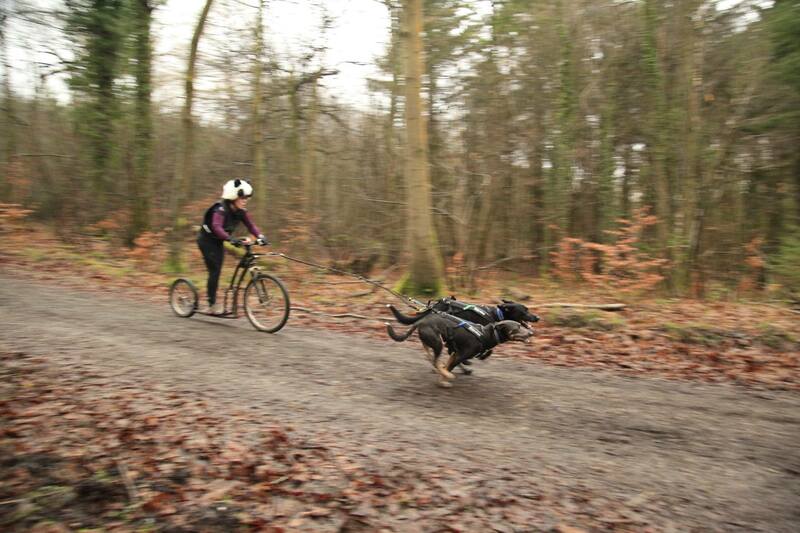 I think most people feel that canicross is something you need to be super fit for, or is something that you need a lot of time for, which is not true, although you do tend to find that you do get fit and you do end up spending lots of time doing it because it is so much fun! For people who have never run before, I do recommend a fitness programme which I know has worked for a number of people, the Couch to 5K, which can be found here: http://www.nhs.uk/Livewell/c25k/Pages/get-running-with-couch-to-5k.aspx – it’s worth remembering that your canine friend will benefit from this too if you have never run your dog in harness before. If you have any concerns about the health of your dog or yourself, please consult your vet or doctor before you start any new fitness routine. 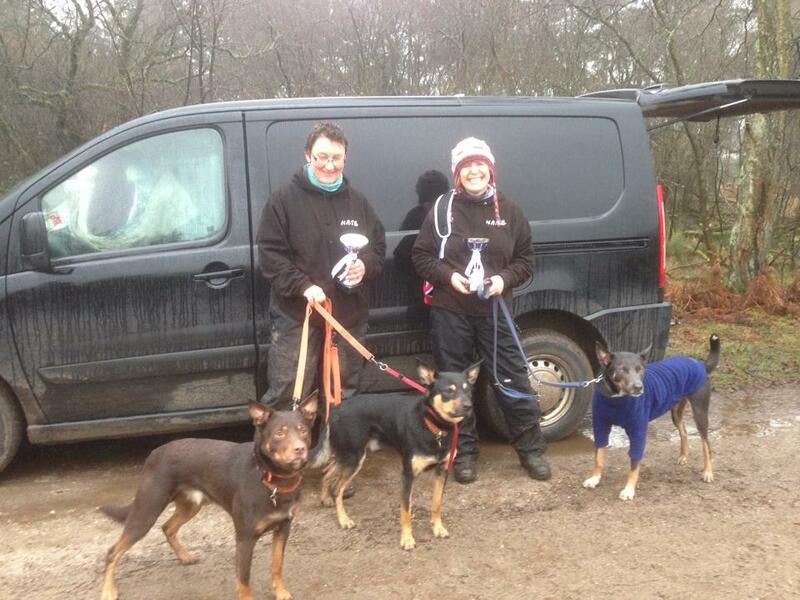 The best way to get you started is to join up with some people who are already organising canicross runs. There are a number of groups now (some really large ones too) that are offering membership as well as informal group runs. 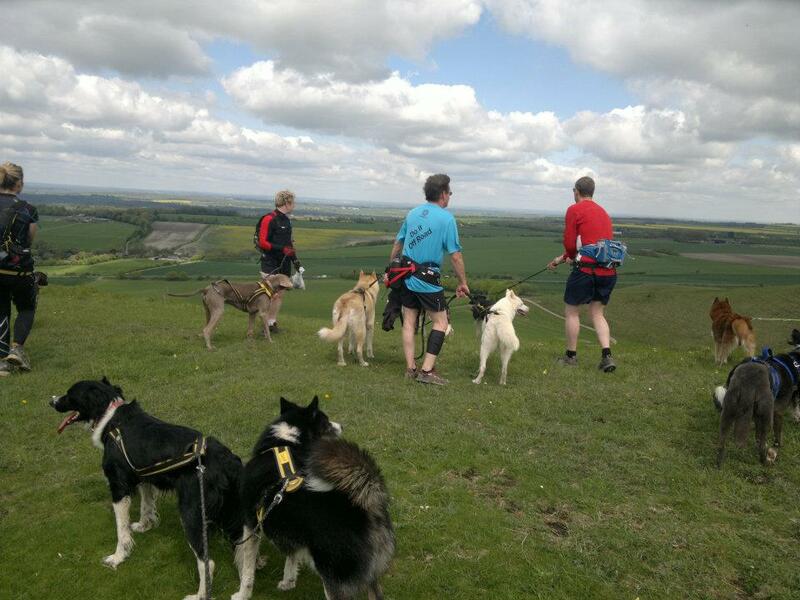 Many of these clubs have spare kit which you can borrow and can give you some great advice on how to make the most of your canicross runs. Below are a few with websites who may be able to help you, there are many more who operate through Facebook groups. Group runs are the best way to get your dog used to canicross with others, which will help if you want to race eventually. If you can’t find a group local to you, you can always try and start one up to get people together in your area. It may be a case of ‘the blind leading the blind’ but running with others is a good way to socialise your dog and prepare you both for racing if you decide you’d like to take part in races at some point. You can of course simply take your dog out and go for a run, there’s no need to be part of a group, I’ve just found it’s the best way to teach dogs how to pull out front, as it encourages them to stick with the other dogs. Although there are many do’s and don’ts you should follow when canicrossing, most of them are common sense and revolve around the safety and comfort of your dog. I’ve listed some of the most important ones below, so if you do decide to get out there this year, make sure you are safe and happy when canicrossing. Expect other trail users to move out of your way, they might well do this but be aware that many may not! 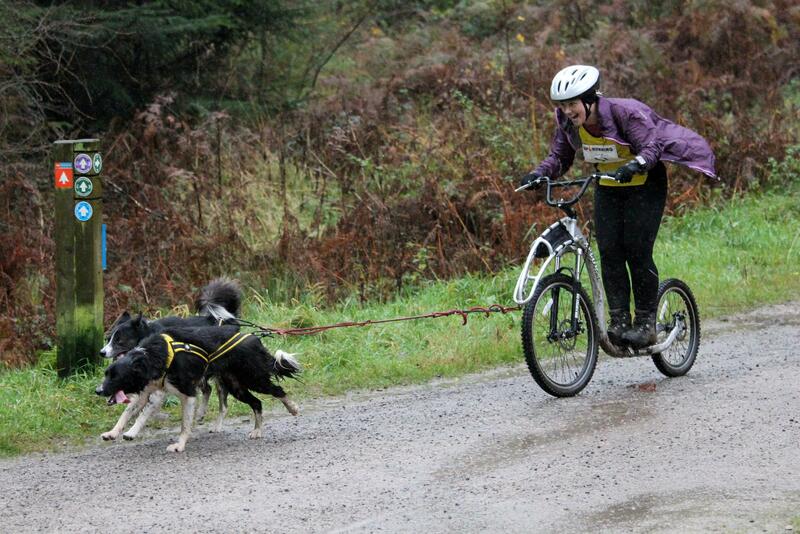 Most important of all is to make sure you and your dog enjoy your canicross runs – Fun is what it’s all about – Good luck!